Your Place in the Universe to Locate Custom Precision Cut Gemstones, Star Cut Gems, Lapidary Repair Work, Personal Cutting Service for Your Select Rough & Fine Handcrafted Designer Jewelry! Garnet Rough from CoCo weight 11.85ct. Garnet Rough from CoCo weight 12.55ct. Finished Gem Pear Shape @6.18ct. @9mm.x13mm. @49.24% return from rough. Sunstone 43.41ct. rough. RB requests a StarCutGem. Finished Sunstone 10.02ct. 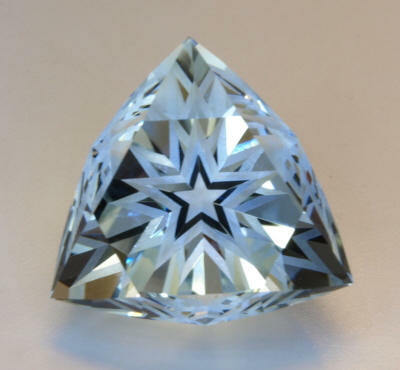 Decagon Star Cut Gem. Shape was chosen to minimize "clear" portion of rough. 12.6mm. Yield 23.10% Some Copper Schiller present. 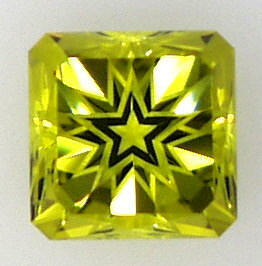 Finished Tri-StarCutGem 28.45ct. Yield from rough @ 48.43% 17.5mm.x17.5mm.x17.5mm. RB Finished Gem 26.40ct. (same Gem 2 pics) 29.84% Yield from rough! 15mm.x15mm. 1.52ct. Color is Very Close!